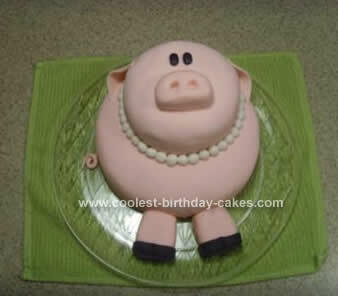 This Homemade Pig in Pearls Cake was made with two 9″ round cake pans. I baked a “rainbow cake” by mixing two white cake mixes, dividing them into 1 1/2 cups in 6 separate bowls and colored each with gel food coloring. Red, orange, yellow green, blue, purple. I then layered them in the order of the rainbow in one pan, and in the reverse order in the other. Wish I could cut open it to show you what it looks like! I then cut one of the cakes down to a 6″ diameter that I put in the freezer to make it easier to crumb coat. After crumb coating both cakes, I made a marshmallow fondant, colored it pink and covered each cake. Then the smaller one was put on top of the larger. The ears were fondant rolled out, cut into a square and cut diagonally. The nose and legs were molded out of fondant. I “glued” them to the piece with water. I used a toothpick to create the “cloven hoof” look. 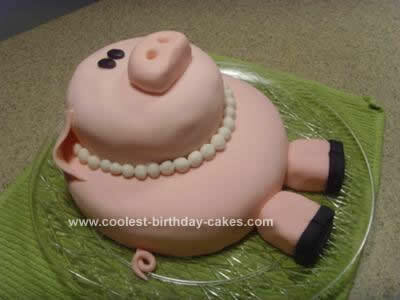 The eyes and feet were made of black fondant and the pearls were formed out of gum paste and attached with more butter cream frosting. This cake was so easy and fun to make.